Review date: 22 July 2001. When I first played with a CD writer, they weren't a brand new technology. Not quite. But they certainly weren't accessible. They were at about the same stage of development that DVD writers are at now. Expensive, temperamental, poorly understood, hard to use. That old CD writer cost an easy $AU5000, and blank CDs cost $AU30 each. The writer ran, of course, at "single speed", writing discs at the same speed an audio CD player can play them back. Writing a whole CD took an hour, plus the not inconsiderable time the burner took to write the essential lead-in and lead-out. The burner sat in a big heavy external box that contained the power supply to run it. It was finicky about its power, and about vibration, and about temperature. It connected to its controlling computer with the SCSI interface, of course; the very notion of IDE CD writers was, at the time, about as sensible as the notion of boats made out of iron used to be. The reason why nobody wanted to know about IDE for CD writers was that IDE devices were, back in the dark days of 1994 or so, lousy. They didn't play well with each other, and you couldn't count on them to deliver a constant data stream. Which was what you needed to do CD writing. CD burners, traditionally, can't stop in the middle of a burn. All slightly modern burners can do multisession burning, where they do more than one separate burn operation on the one disc. But they can't stop and restart in the middle of one session. If they stop, they can't find where they were again. And the CD-R is, according to ancient tradition, now but a humble drink coaster. The usual reason why burners stopped in mid-burn - and why most of them still stop in mid-burn - was and is a "buffer underrun", where the computer doesn't deliver data steadily enough to keep the burner supplied with data to burn. You might think that 150-odd kilobytes of data per second doesn't sound very demanding for any computer with a hard drive, and doing a faster burn on a modern PC ought to be just as easy. But the problem was, and is, that the data has to be supplied steadily, because the burner doesn't have much on-board buffer memory, compared with the speed at which it's spitting data onto the disc. A data interruption of just a couple of seconds, while Windows flogs itself merrily in the way that Windows is prone to do, is sufficient to mess up the burn operation. Well, 1X burners aren't quite at the cutting edge any more, and you might have noticed that current CD writing technology's a bit cheaper, too. When I first wrote this review you could get Acer's CRW 2010A CD writer for $AU379.50, including delivery, from Aus PC Market. 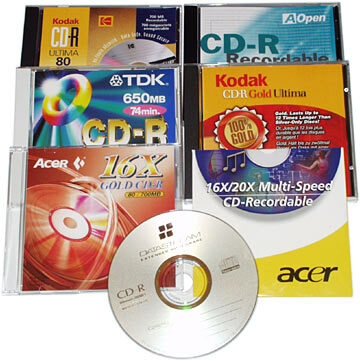 Which can read CDs at 40X speed, write CD-RW discs at 10X speed, and write plain cheap CD-Rs at 20X speed. It uses the IDE interface, so it can be installed, without a special controller card or expensive external box, in pretty much any current PC. And, like a variety of current CD burners, it is immune to buffer underruns, because it can start and stop write operations at arbitrary places, without losing track of where it is. The Acer drive comes with a quite respectable bundle of stuff. This isn't a "bare drive in a bag" deal. First and foremost, you get the full version of the popular, and excellent, CD writing package Nero, from Ahead Software. And an actual paper manual for it, too. Luxury. Nero is a full-function CD authoring program, with an imposing feature list as of version 5.0, and even more stuff in version 5.5. You get version 5.5.2.2 on the disc that comes with the Acer burner, plus an "upgrade file" floppy disk that patches some bug or other. I didn't bother with the floppy, because I just took advantage of the Ahead Software download page and upgraded v5.5.2.2 to the current-as-I-write-this v5.5.2.4. 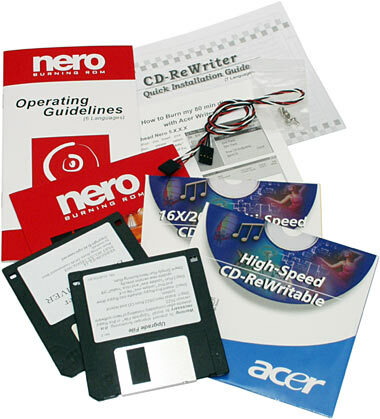 The Nero disc also contains InCD packet writing software, which lets you use a CD-RW disc pretty much like a giant floppy, and "finalise" it at will for use as a normal CD in ordinary CD-ROM drives. Apart from the Nero stuff, the Acer package gives you a Quick Installation Guide which is adequate for getting the drive up and running, one CD-R and one CD-RW disc, and an audio cable for people who want to hook up the CD writer's audio output to their sound hardware. And there's a DOS driver floppy, which is a nice touch; usually, people who want to make a current model CD-ROM drive work on an old DOS machine need to fish around for downloadable drivers. The only thing the Acer drive doesn't come with is a proper manual. It's just a drive, though; the Quick Installation Guide will do for almost all purposes. Apart from its spectacular speed specifications, there's one thing about the CRW 2010A that sets it apart from older CD writers - though not from a number of other recent ones. That's "Seamless Link". Seamless Link is what Acer have chosen to call buffer underrun prevention technology. Most people call this technology "BURN-Proof", because that's what Sanyo called it, and they came up with it first. That rather lumpy name stands, according to Sanyo, for "Buffer Under RuN error Proof", which suggests to me that there are people at Sanyo who wouldn't know an acronym if one painted itself purple and danced naked on the table in front of them singing "acronyms are here again." Anyhow, Sanyo trademarked and patented BURN-Proof, and all of the other CD writer companies do basically the same thing in their own different ways and give it other trademarked names. The Seamless Link name is a Philips-Acer thing; Ricoh, call it JustLink. Yamaha call it Waste-Proof. Nobody's called it Coasters-B-Gon yet, but it's only a matter of time. Whatever you call it, this technology lets a burner that's not getting data fast enough pause a write operation, then restart it when it's got some more data to be going on with. Without making a coaster. CD burning software that supports a given burner's flavour of BURN-Proof probably won't even show you the "test write" option, that lets you do a dummy write run and see if the buffer empties or not. It doesn't matter whether the buffer runs dry, with BURN-Proof or JustLink or Seamless Whatever, so you might as well just dive right into the real write operation. Your write will finish, barring disastrous media problems or someone kicking the plug out of the wall. Nero recognises the Acer drive, and behaves in exactly this way. The pause-and-resume operations that anti-underrun tech does leave little glitches on the disc wherever they happen. This can cause compatibility problems with old - that is, slower-than-4X - CD-ROM drives and pre-1995 audio CD gear. Pretty much everything else should be fine with BURN-Proofed discs, though, provided there's nothing else wrong with them. Which brings us to an important point. Just because you can do a high speed write, without worrying about data flow interruptions any more, doesn't mean that you should. For two reasons. One, pausing and resuming the write takes time. If the write's paused and resumed many times, all of the little delays can leave you with a rather longer overall burn time than you would have had if you'd picked a less adventurous write speed. A "20X" burn can take longer than a 4X one, if it's done on a sufficiently screwed up system. Two, many cheaper CDs don't want to be written to very quickly. 12X seems to be the ceiling for most brand name discs on the market as I write this; 8X may be the ceiling for some real cheapies; truly lousy media may not handle anything better than 4X. Try to write to a disc at a higher speed than it supports and the write may proceed perfectly well, but you'll not end up with all of the data on the disc. If your buffer's run dry several times during the write, you may end up with the worst of both worlds. You burn the disc so slowly that you might as well be using 4X, but each of the mini write sessions happens too fast for the media. So after the lengthy write period's over, your disc is still useless! When I started playing with the CRW 2010A, it rapidly became apparent that the "X" numbers in its specifications are as misleading. As usual. Just looking at the raw data transfer figures, you'd think that a "20X" CD burner would be able to write a 650Mb CD in about two minutes and 40 seconds. "1X" is 150 kilobytes per second, 20 times 150 is 3000, 3000 kilobytes is 2.93 megabytes (because there are 1024 kilobytes in a megabyte), do the maths, and two minutes and 42 seconds is how long 650Mb should take. It's not actually that fast, though. In fact, a 650Mb "20X" burn will probably take the thick end of six minutes. The first and less important reason is that when you burn a CD, your CD writer doesn't just spin up the disc and then start writing as fast as it can. At the beginning and end of every session - and if you write a full CD in one go, that's one session - there's an extra chunk of data. Those two chunks create a bit of overhead on top of your user data write time. The chunk at the beginning is the "lead-in", which contains the Table Of Contents (TOC) for that session, and information about where the next TOC will be found, if you're making a multisession disc. The chunk at the end of the session is the "lead-out", which contains no data and is basically just a safety area to let drives know where the session ends (so they don't try to read blank parts of the disc). On multisession discs, the lead-out also gives the burner a piece of disposable disc where it's going to start writing the next session, to remove any chance of it accidentally trying to overwrite the end of the previous one. The lead-in and lead-out don't account for a big overhead, though. The main speed loss comes from the usual cause of strangely low CD-ROM device performance. 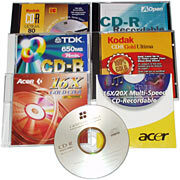 Current CD-ROM drives, and current CD writers as well, don't have the same access speed for every part of the disc. They have a peak speed, though. Needless to say, the peak speed is what gets printed on the box in four inch gold-embossed letters. Current CD drives use transports that spin the disc at a constant number of revolutions per minute, only slowing down if they're having a hard time reading it. The constant-rotational-speed system is called Constant Angular Velocity, or CAV. When a drive uses CAV, the smaller tracks towards the centre of the disc take the same length of time to pass under the read or write head as do the larger tracks towards the edge. Data on CDs is stored at a constant density per unit length of track over the entire disc, and so CAV disc transports are slower to read or write data to the inner tracks than they are to do the same thing on the outer tracks. The opposite of CAV is Constant Linear Velocity, or CLV, where the rotational speed of the disc is changed to keep the rate at which the data passes under the laser the same. Audio CD players all use CLV, so that the pickup sees a nice constant data rate. So did old data CD transports, including the early CD burners. But CLV's not practical for high speed CD-ROM drives. A "40X" CAV CD-ROM drive spins the disc at a screaming 8000 revolutions per minute - which explains the awful noises you're likely to hear if you put an unbalanced disc in a fast CD-ROM drive. But 8000RPM only adds up to "40X" speed (6000 kilobytes per second) on the outer tracks of the disc. The same rotational speed on the inner tracks gives you about 15X speed, because that's the ratio between the size of the innermost CD tracks and the size of the outermost ones. If you magically switched your 40X drive to use CLV, you could make it speed up for the inner tracks, so you could get 40X speed on the middle of the disc as well. But you'd have to spin the disc at more than 21,600RPM to do that. That'd mean that while you were looking at the middle tracks, the edge of the disc would be moving at nearly 490 kilometres per hour. Since CDs have been known to fly apart dramatically even in drives slower than 40X, a drive spinning 2.7 times faster than 40X would probably be fun to watch. From behind a Plexiglas shield. But it wouldn't be a very useful data retrieval device. So what drives do instead is use the simple and cheap CAV design, and spin the disc as fast as the transport can safely manage. The read/write speed for the outermost tracks determines the "X" number on the box, and you just have to put up with not-so-great speed on the inner tracks. The final piece of data in this puzzle, which explains why you so seldom see peak speed from CD devices, is that CDs are written from the inside out. The less data there is on a disc, the nearer to the centre will be the outermost track with data on it, and the slower will be the best speed a given CAV drive can manage when reading that disc. How's all of this relate to the Acer drive? Well, there are several limiting factors for super-fast CD writers, and the ceiling safe spinning speed for CDs is one of them. The other limit is how fast you can get data onto a blank CD. That depends on the capabilities of the write assembly, and on the behaviour of the blank CD you're using. As mentioned above, many cheaper CDs can't be written to at 20X. Well, not by any drive that exists yet, anyway. You can do the write just fine, but the recording layer on the CD-R isn't good enough that you'll end up with all of the data you thought you had. I'll get back to that issue later in this review, when I try actually throwing some bits onto some discs. But let's assume for the moment that you've got a blank CD that can accept data from your shiny new super-fast CD burner at full "20X" speed - 3000 kilobytes per second. If you want to write to the middle of the disc at that speed, you'll have to spin the thing at more than 10,800RPM. Which is not as ridiculous as 40X reading from the middle of a disc, but is still asking for trouble, of the BANG-tinkle kind. Rather than try CLV-ish speed tweaking for the middle of the disc, it's much simpler to, once again, just go CAV all the way, print the peak speed on the box, and have done with it. Across the full size of a 77 minute 27 second CD - rather more data than you'll find on most discs - the Acer drive managed an average read speed of 30.26X, according to Nero CD Speed. The peak speed was 39.86X - acceptably close to the 40X it's meant to do - and the starting speed was 17.98X. On an 80 minute CD, it probably would have peaked at a bit more than 40X. So that's what it can manage when reading. If it spins the disc at "20X" CAV speed for a write operation, then its average speed can be expected to be about 15X, for a full 700Mb disc. Write to just the inner tracks and you'll get a lower speed, as usual. 15X is 2250 kilobytes per second, or about 2.2 megabytes per second. So you'd expect a 700Mb "20X" burn to take around five minutes and 20 seconds, plus a bit for the lead-in and lead-out. Which is pretty much how long it does take, as it turns out. I'm guessing somewhat about what the drive's doing, because Acer don't take any particular pains to tell the world what the capabilities of this drive really are. It doesn't come with a proper manual, and there are no serious specs on its page on the Acer site, here. But the numbers line up right if you assume that this drive uses "20X" CAV when it's doing a "20X" burn. Interestingly, though, the drive doesn't seem to do straight CAV when you tell it to burn at a slower speed. If a 700Mb "20X" burn takes a bit less than six minutes all told - and it does - then a 700Mb "12X" burn should take more than nine and a half minutes, right? But as it turned out, 700Mb at 12X actually takes less than seven and a half minutes with this drive, for more than 1600 kilobytes per second overall, genuine, write speed. I presume that the drive's taking advantage of the RPM headroom it gets from only having to hit a 12X peak speed, and now actually is going a bit CLV-ish at the beginning of the write - spinning the disc faster, and writing at a speed closer to proper 12X, over more of the disc than you'd expect. The term for this strategy is Partial Constant Angular Velocity, or P-CAV, and it's a very pleasing thing; 12X ends up being about 80% as fast as 20X! OK. Time for some media tests. When I first started testing the Acer at high write speeds (it supports 4X, 8X, 12X, 16X and 20X CD-R burning), the buffer levels were flapping around all over the place and Seamless Link was working its magic on every write. Which wasn't the way things were meant to be. I have the Acer drive connected via a 40 wire cable to one of the Ultra ATA-capable sockets on the A7A266 motherboard I'm using in this computer (I review the A7A266 here), and so it should have been running in Ultra ATA/33 mode. That mode's 33 megabyte per second peak bandwidth isn't really all available to drives, but the system still shouldn't have had any trouble delivering about three megabytes per second to the burner. The hard drives in this system are all running in Ultra ATA/66 mode, after all. In the olden days, a plethora of horrible IDE implementation problems could be blamed for lousy data throughput. With modern PCs, though, even if the hard drive delivering the data and the CD writer receiving it are both on the same motherboard IDE channel, there's only one probable explanation. DMA mode, or the lack of it. Direct Memory Access is a general term for what's happening when a device in a computer can deliver data to or from memory - and, thence, to or from another DMA-capable device - without the CPU having to be involved. All of the variously-titled "Ultra ATA" or "Ultra DMA" IDE modes - UDMA/33, UDMA/66, UDMA/100 - are DMA modes. But Windows machines won't use DMA by default. The reason for this is to make sure that Windows boxes work with old non-DMA-capable drives, and with characterful hardware that thinks it can do DMA but can't really. All modern IDE devices support DMA transfer modes, though. If you don't have DMA turned on, they'll stay in PIO Mode 4. In PIO Mode 4, you'll be unlikely to see more than about two and a third megabytes per second from any IDE device, and transferring data from one IDE device to another - as happens when you're burning a CD - is likely to leave you with each device running even slower. Turning on DMA, if you haven't done it yet, is pretty simple. First, you may need to install a DMA-capable driver for whichever IDE controller you're using. Probably, you'll be using the controller that's built into your motherboard, but motherboards with four IDE connectors have two controllers, and there are after-market IDE controller boards as well. Windows has drivers for some controllers, and doesn't have drivers for others, and without the right driver you won't be able to use DMA mode at all. Some drivers automatically handle DMA mode setting all by themselves, turning it on if it's supported by a device, so you don't have to do it yourself. Ordinary motherboard IDE controllers generally don't do this, though. 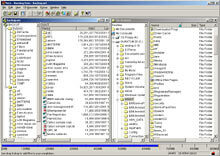 To enable DMA mode in Windows 95 OSR2 and 98, go to the properties page for each of your drives by double-clicking them in Device Manager, then going to Settings and clicking the DMA box. Generally, if a drive doesn't support DMA, then after you reboot the box will just be unchecked again. No harm will be done. In Windows 2000 - which I'm running on this machine - you activate DMA in the IDE controller properties, again from Device Manager. The IDE channels will be listed under "IDE ATA/ATAPI Controllers"; double-click each listed Channel, go to the Advanced Settings tab, and set the Transfer Mode option to "DMA if available" for each device on the channel. This is more elegant than the Win98 solution; if the device that's on that channel doesn't support DMA then it won't be turned on, but if you swap in a device that does support DMA, it'll now be used. DMA was, indeed, my problem. There hadn't been a drive connected where the Acer was now, and that channel was still in PIO mode. When switched to DMA mode, everything worked the way it was meant to. Now it was time to torture some CD-Rs. I piled up an assortment of CD-Rs and prepared to do a not-very-scientific test. First, I tried the pack-in Acer CD, which is identified by CDR Identifier as actually being made by Acer, and not some other manufacturer. This disc says "16X/20X Multi-Speed CD-Recordable" right on the cardboard envelope, and it comes with the drive, so it's going to work fine at 20X, right? 664Mb of data burned onto this "80 minute" disc (with a maximum capacity of a nominal 700 megabytes) at a very respectable speed. Not as fast as you'd naively expect from "20X", as explained above, but speedily nonetheless. Unfortunately, the disc didn't come out right. The verify process revealed that one file out of 2117 wasn't the same as the original. That's not a disastrous result, but it's not a good one either. So much for the included media, eh? Well, maybe Acer could do better with their other discs. Another 700Mb Acer disc was duly procured. These discs look like premium media; they come in slimline jewel cases, and a box of 10 will cost you $AU22 delivered from Aus PC Market (CD-Rs are in the Accessories/Media section of the Aus PC site). 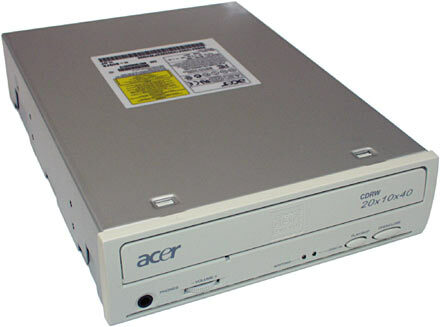 The Acer 700s have a proud "16X" on the case cover, not to mention "HIGHLY COMPATIBLE" in the corner, and the ID information at the beginning of the disc again says they're actually made by Acer. And, at 20X, this disc worked. Successful burn, no verification errors. Groovy. On to some other premium media. A Kodak 650Mb disc, IDed by CDR Identifier as being made by Kodak. This time, Nero didn't give me the option to run at 20X; CDR Identifier didn't have an opinion about the burn speeds supported by the disc (actually, the current version doesn't seem to have a clue about any discs...), but something on it told Nero not to allow anything faster than 16X. OK, no problem. I tried 16X. The burn was fine, but the verification failed, with a couple of non-identical files. Hmm. I had another Kodak to hand, this time a 700Mb disc, and I tried a mere 12X burn, filling it to the brim. This worked fine, with all files OK, as you'd expect from a premium brand disc. And it still managed a healthy 1.6Mb per second overall, including lead-in and lead-out, presumably thanks to P-CAV. That's better than 96 megabytes per minute, which ought to be fast enough for most purposes. Righty-ho. How about a TDK brand disc, made by TDK according to CDR Identifier. A 650Mb disc which, according to the front, was only rated for 8X writing. Damn the torpedoes! 16X speed ahead! Well, I got an OK write speed, but the disc I ended up with had no filesystem. Verification couldn't even start. So I probably should have paid attention to the label, huh? I had half of a 25 disc spindle of cheap "Datastream" 700Mb CD-Rs sitting on the shelf, so I sacrificed several of them to the CD-R monster. These discs are made by Prodisc, a not-particularly-famous but awfully popular manufacturer, and 25 of 'em cost a quite reasonable $AU33, including delivery, from Aus PC Market. On the Datastreams, one out of three 20X writes worked. One of the ones that failed only had one mis-written file, but the other one had file errors a-go-go. I tried 16X twice; one write worked, one failed. I tried 12X twice; one worked, one failed. At a mere 8X, the Datastreams seemed OK, except for when I kept merrily using the computer while writing a disc. That used to be a big no-no, as it was a great recipe for a buffer underrun. But this is a fast machine, and Seamless Link should take care of any data delivery problems that arise, anyway. But that disc ended up with 16 failed files. Weird. Now, I had a go with the pretty Pyrod rainbow-discs that I review here. These CDs are made by Postech, another little-recognised but commonly-seen maker of cheap CDs. The rainbow discs are only alleged by Pyrod to be certified up to 8X, but Nero let me try anything up to 16X, so I did. At 16X, not entirely surprisingly, I managed to make a Crash-O-Disc. That's a CD whose TOC information (well, I think it's the TOC that causes this...) is munged severely enough that feeding it to a Windows machine is likely to mean you'll have to stab the reset button to un-hang the computer. The OS, brought to you by the diligent software artisans at Microsoft, assumes that the CD-ROM drive will figure out what it's looking at quite quickly, and important system processes wait until it does. If it never does, then sayonara Windows. Another 16X attempt made a disc that had only one file different - this time, the error had had the decency to be in the data area, not in the TOC. At 12X, I managed to burn a coloured Pyrod disc just fine, but it had a filesystem problem when it was done, and no files were legible. At least the computer didn't choke on it. At 8X - the speed at which these discs are supposed to work fine - I got a merely slightly broken disc. One out of 2443 files wasn't what it should have been. Pyrod's fancier individually jewel cased gold CDs are supposed to be certified up to 12X speed. I had one left from the old review, so I tried it at 16X. No go; the write didn't even start, because there was a power calibration error. If you have to have a write failure, a power calibration error at the start is a good kind to have, because it lets you re-use the disc. OK; let's try 12X. This time the burn worked, and the verification showed all files present and correct. So it would appear that the more expensive Pyrods (made by Digital Storage Technology, not Postech or Prodisc) actually are higher quality. It's not a great revelation that cheapie-discs are no good for high write speeds. But the performance I got from the brand name discs was a bit disappointing, too. You should be able to get data onto any Kodak or similar "premium" disc at 12X, but even ones with "16X" or higher on the label don't seem to actually be reliably capable of it. Not with this drive, anyway. Perhaps a Plextor PlexWriter 16/10/40A would do better. Plextor are the widely acknowledged kings of optical disc drive quality, and they've only relatively recently started making IDE CD burners at all. The 16/10/40A (or, as its friends call it, the PX-W1610TA/SW) is the best IDE burner they currently make. But you'd want it to be rather special, for the money. Its US retail price is $US229 (plenty of places have it cheaper), but its Australian price seems to be more than $AU650 excluding shipping, from the few places that carry it and actually have stock. So it's getting on for twice the price of the Acer. A few days after I first put up this review, Plextor announced a new IDE drive with 24X CD-R write speed. Its suggested retail price is $US289. Me, I'd settle for a cheaper drive that does 8X writing on cheap discs and 12X on premium ones, even if the expensive Plextors could manage 16X or better on any old disc. Which they can't, of course; apparently the 16/10/40A is surprisingly good at getting data onto at least some brands of cheap CD-Rs at 16X, but there are a lot of cheap CD-R brands out there, and I wouldn't bet my life on any of 'em. What's this all add up to? Well, don't get too excited about "20X" writing. I dare say there are discs out there that support it reliably, but since your shiny new CD burner is unlikely to manage genuine 3000 kilobyte per second writing over the whole disc, 20X is not as much faster than 12X as you might think. With a drive like the Acer that seems to do P-CAV for slower writing speeds, 12X certainly isn't only twelve-twentieths of the speed of 20X. Since even premium brand CD-Rs don't seem to support 16X and higher write speeds properly yet - not with cheap drives, anyway - you'll probably have to leave data verification turned on if you're using that speed. Which throws away the speed advantage. 20X-plus-verify takes longer than 12X without verify. And, of course, you might not be getting a fast write speed from 16X or higher in the first place, if your system can't deliver data fast enough and you end up BURN-Proofing your way through the disc at a miserable effective write speed. Lots of premium media should work fine at 12X with the Acer, and at that speed it gives you a respectable write speed of about a hundred megabytes per minute. At that speed, you won't need to use verification to make sure the burn worked, unless the integrity of the disc contents is essential for your continued existence. I'm happy with the Acer. It's a good package at a good price. I'll be interested to compare it with a Plextor if I get a chance, and see if dodgy CD-Rs can be burned a bit faster in a better drive. But I'm not itching for the opportunity. If you've been waiting for a decently cheap drive to upgrade to, from a 4X or slower burner, then the Acer CRW 2010A is a good choice. It'd make a great first CD burner, too. Just don't believe the hype. US readers can find tons of CD and DVD drives listed on DealTime, here!